Including:1 duvet cover+1 flat sheet+2 pillowcases.NO COMFORTER INSERT, NO FITTED SHEET. Cotton fabrics: soft cotton.with silk comfort environmental health.no pilling,not fade ,not shrink.smooth refreshing give you health and good sleep. Printing and dyeing: Natural plant material .It contains the active gene that can react with the fiber. Quality assurance: quality perfect! FADFAY adheres to offer the high quality products. Cal King(3pcs): 1 Duvet Cover 106 x 92 inches, & 2 Pillowcases (Shams)20x36 Inches. NO COMFORTER INSERT, NO FITTED SHEET, NO FLAT SHEET. 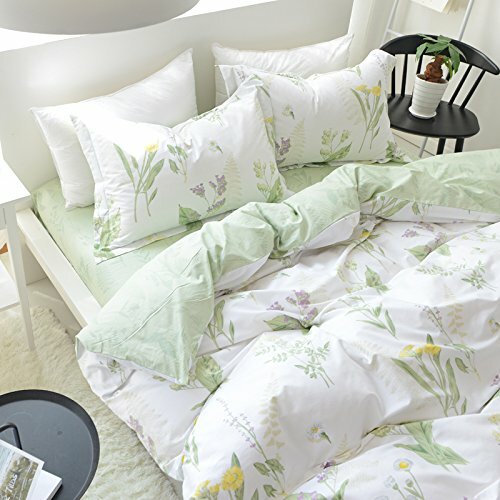 Material:100% Cotton,super soft and comfortable.Nordic ikea Style Korean Simple American Country Fresh Pastorale Small Print Floral Style.Active environmental protection printing and dyeing.MACHINE WASHABLE AND MACHINE DRYABLE, EASY CLEAN. We can use it on the bedroom, guest room, school dormitory, hotel... 100% cotton bedding set can use everywhere you want, and you can also take it when travelling, clean and comfortable is the best thing we need! Open dynamic new journey to sleep.smooth refreshing give you health and good sleep.high textile process,almost harsh swing process ,not only beautiful more durable.an ideal bedding set to decorate your bedroom. IMPORTANT NOTE : This bedding set includes a duvet cover for quilt/duvet/comforter but WITHOUT any quilt/duvet/comforter/blanket inside, just COVER.There is a button on the bottom.you can put your own comforter inside the cover. If you have any questions about this product by FADFAY, contact us by completing and submitting the form below. If you are looking for a specif part number, please include it with your message.